BulwarkHost Review 2019: Is BulwarkHost a Good Hosting? 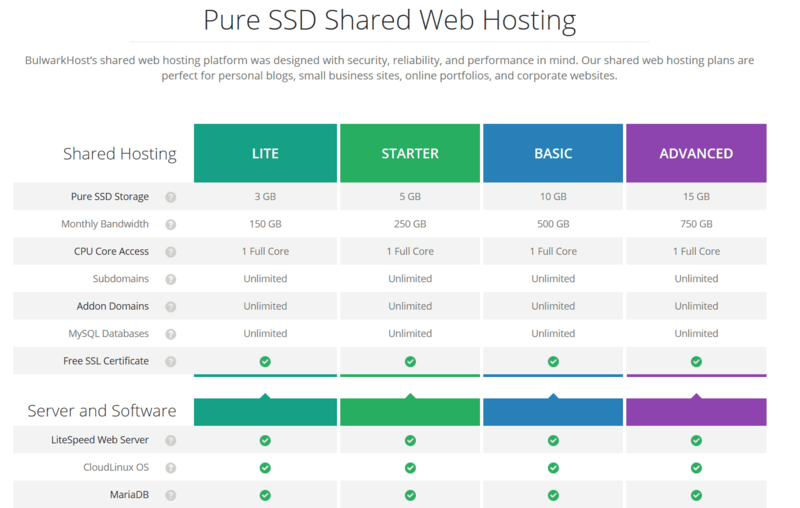 BulwarkHost offers average SSD shared hosting with unlimited domains and databases. If you're looking to host adult content, they’re worth checking out since they allow legal adult content. BulwarkHost has been offering web hosting since 2009 and provides an average portfolio of shared hosting services to clients around the world. Their packages are best suited to personal and small business websites, but those with adult websites may also want to check them out as they do allow hosting for legal adult content. The features for this host are decent but nothing really spectacular outside of unlimited databases. They don’t list support for more advanced developmental tools, so code-savvy webmasters may want to look elsewhere. This is one of the few shared hosts that allow mailing lists: most hosts won’t let you run mailing lists from your shared email server. They also offer extra security features for their plans including anti-virus, anti-spam, and Cloudflare integration. If you’re looking to host a website with adult content, this is a provider worth checking out. Of course, this is provided that your content is legally allowed. I’d recommend going with Basic or Advanced for adult hosting as these plans offer the most storage and bandwidth. For those that need help setting up their website, this provider offers the Softaculous auto-installer with hundreds of one-click installable apps. Everyone else will be able to use cPanel access to upload their files. For shared hosting, you have two options. The first is SSD shared hosting, which has all the features listed earlier with the only differences being storage and bandwidth. Here’s a quick breakdown of their SSD plans. I’m not very impressed by the Enterprise plans as they don’t give you much in the way of storage for the amount you pay. This is especially so for adult websites, which tend to be media-heavy. Unless you really have to have two CPU cores, you’d be better off with the Advanced Shared SSD plan rather than any of the Enterprise plans. Pricing for the SSD plans are on par with the industry average. Of course, the main quoted price is if you pay three years in advance. Their monthly and annual rates are higher, but not too bad. For what they offer, the Enterprise plans are a bit pricey. The Advanced Shared SSD plan is as good or better than the Enterprise Lite, Starter, and Basic plan outside of the number of CPU cores. While the Advanced Enterprise plan is better regarding storage, bandwidth, and CPU cores, you will pay four times as much on average. BulwarkHost’s support is somewhat poor as they only offer online ticketing support. They don’t offer phone or live chat technical support (though you can access their live chat for sales support), and their knowledge base is very limited. For as much as they charge for some plans, you’d think they’d offer better support. That said, every time I’ve submitted a ticket on server-related issues, they’ve been quick at responding to all of my queries. BulwarkHost offers shared hosting plans with reasonable features and average pricing. I don’t find them particularly spectacular in any aspect, and their limited support channels are a concern. However, if you’re looking for an adult hosting provider, they are worth checking out. Wondering how BulwarkHost stacks up against other Web Hosting companies? Enter any other Web Hosting company and we will give you a side-by-side comparison.